I had a great chat with Del Ratcliffe this week about plans for all of his courses, including the Harry Jones course near Renaissance Park. Plans are not yet finalized but they have brought in Ron Garl (he designed the now closed Regent Park golf course) to consult on a likely redesign of all 18 holes. This municipal course has many holes built on the site of a former city landfill which presents many challenges for the maintenance and upkeep of good playing conditions. If the redesign proposal moves forward, the course would likely be closed for 18-24 months. 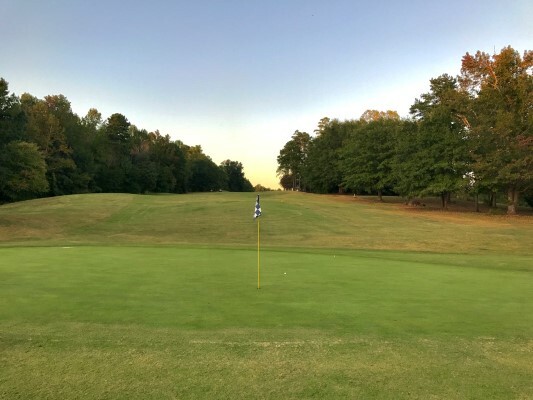 This is one of the reasons Ratcliffe Golf Services is investing now in making improvements to their other courses -- Charles T Myers (new greens this summer), the Sifford Course at Revolution Park and Sunset Hills. I'll keep you posted as I hear more about the plans for this course. My first time back at RP in several years. I do enjoy the uniqueness of the layout, with lots of elevation changes and hilly terrain, a few blind shots. It was very familiar even having not played here in so long. That said, the course is quirky. Lies will be hit or miss everywhere. Since so many holes are sloped and hilly even fairway lies will be iffy. The fairways were in good shape for the most part. The rough on many holes had not been mowed recently, so we nearly lost a few balls in it. The greens on the front 9 were really good and quick. The back 9 was like a completely different course and very disappointing. Most of the greens were nearly unputtable due to sandy bare spots. Count two putts and pick up your ball. That bad. Not sure why the front 9 and back 9 were like night and day. I will say that the pro shop attendant mentioned that they had aerated 2 weeks ago and gave us a coupon for $20 off our next round if we come back in the next 2 weeks. I won't have a chance to use it and the expiration was kinda short, but it was a nice gesture. I do enjoy the challenge of this course so it was fun being back, but I'd like to see the back 9 greens in better shape when I play next.